The outspoken Shark took to Twitter to give Jack Dorsey an earful. Earlier this week, Twitter rolled out a new tool that it hopes will help the site's ongoing harassment problems. A beefed-up mute feature is now able to filter phrases, keywords and hashtags that a user deems offensive, and can mute entire threads if desired. The users will stop receiving notifications from any nasty threads they chose without removing the thread from their timeline or blocking anyone. In short, while it doesn’t stop anyone from writing vile tweets, it prevents the target of attacks from seeing them. Is that enough? 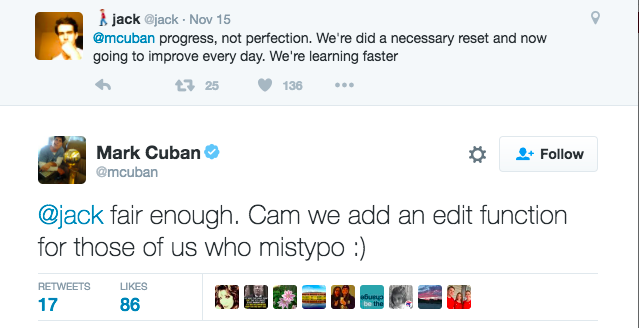 According to Mark Cuban, no. 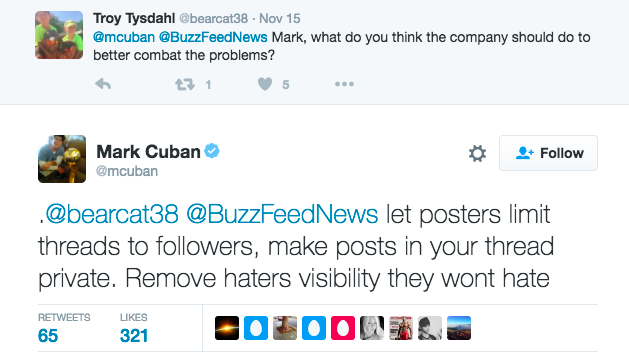 Many of Cuban's 5.9 million Twitter followers jumped in the conversation, asking what he thought would be a more effective solution. Some offered other suggestions, which began to highlight how difficult this problem is to solve. Jack didn't get back to him on that one. Here's hoping!